The course is aimed at recruiting more referees to join the ranks of the currently active ones officiating in local league matches and the national soccer league, Telekom S-League. The number of referees has dropped slightly since a peak in 2008 and the SIFF referee development office is trying to halt this negative trend. 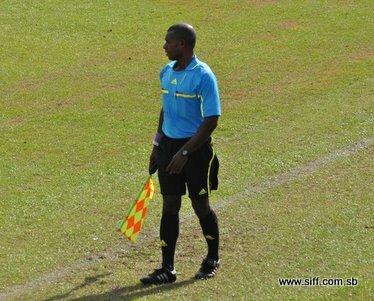 SIFF referee development office, Justin Mutukera, is making a call for interested persons to sign up for the course saying that compared to the past there is a real opportunity for referees to excel at the regional and international level. “It is an exciting time to be a referee now as we see our individuals go as far as FIFA competitions through the FIFA Referee Assistance Program. Locally, we also have a good round up of competition which will prepare our referees for the international scene. I encourage young people especially to join this course and enter the exciting world of refereeing,” Mutukera says. The target group for this course are 17 – 30 year old men and women who are fit and healthy and already have a good understanding of football. The course is also open to interested persons from the outer provinces but accommodation will not be provided so potential participants are advised to make their own arrangements. The basic refereeing course covers a general to specific analysis of the FIFA Laws of the Game (LOG) which governs how football is played. The course trains referees in the analysis, interpretation and application of the FIFA LOG and integrates important areas like communication and flagging techniques. Completion of this course is required to progress to the elite level which qualifies referees for FIFA organised training courses and workshops. A basic refereeing certificate qualifies a referee to officiate in junior and youth competitions as well as lower division matches in the Honiara Football Association (HFA) competition hierarchy. The course will commence on Monday 5th September and will run for one week. Each session will be held from 5:00pm to 7:00pm at the SIFF academy conference room and pitch. The timing is to allow the opportunity for working people to attend. Interested persons are asked to register at the SIFF office. Due to the limited number of spaces for the course only those who register early will be considered. Referee affiliation fees are charged at $25 per person per year and the course fee is $50. All payments are to be made at the SIFF office at Ranadi.